Research undertaken for the European Journal of Clinical Nutrition has claimed that drinking three or more cups of tea a day is as good for you as drinking water and may even have extra health benefits. This apparently dispels the “common belief that tea dehydrates”. Who believed that? Not me. Ø Some studies suggested tea consumption protected against cancer, although this effect was less clear-cut. Public health nutritionist Dr Carrie Ruxton from Kings College London was quoted by the BBC as saying: "Drinking tea is actually better for you than drinking water. Water is essentially replacing fluid. Tea replaces fluids and contains antioxidants so it's got two things going for it." And it’s hotter too! "Studies on caffeine have found very high doses dehydrate and everyone assumes that caffeine-containing beverages dehydrate. 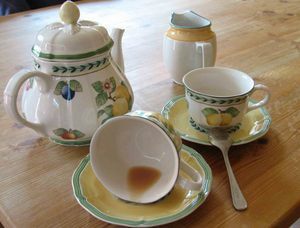 But even if you had a really, really strong cup of tea or coffee, which is quite hard to make, you would still have a net gain of fluid.” Well, yes, you mean no matter how many tea bags you use it’s still going to be more liquid than solid? Now, of course, I love a pot of tea as much as the next man but all this healthy mumbo jumbo about the daily cuppa is a mite ambitious. Can’t we just appreciate the humble pleasures of a good cuppa and leave it at that? Funding for this piece of 'research' was provided by surprise, surprise … the Tea Council.